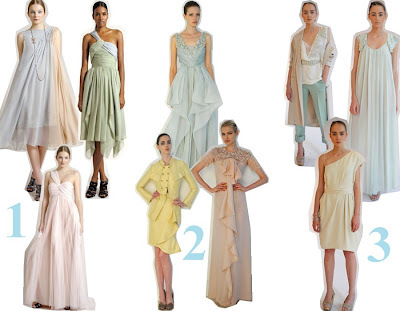 I noticed a pattern in many of the Resort 2009 collections, and decided to write about my favorite trends, looks, and new inspiration. Click to enlargeeeeee. 1. Pastels Baby blue, mint green, light yellow, soft pink, peach, lavender...not only do these colors make great decorations with your baby shower or Easter celebration, they complete an outfit. 2. Island tribal Badgley Mischka and Naeem Khan prove that intricate details work wonders. Beads, embroideries, and tons more add a magic touch to the already fun prints and colors! First 4 from the left are Badgley Mischka, the rest are Naeem Khan. 3. High waisted bell bottoms Perfectly balancing a simple outfit and radiating that relaxed vibe, high waisted bell bottoms have proved very stylish this season. Colors like gray, white, and navy give the hippie look a fresher edge. First 3 from the left are Fendi, the rest are Yigal Azrouel. 4. My favorite collection, Chris Benz Being unfamiliar with Chris Benz's work, my eyes popped out when I saw these outfits. 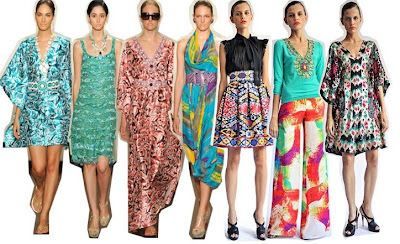 Juicy colors and that chic slacker look make this Resort 2009 collection my favorite! What's yours?